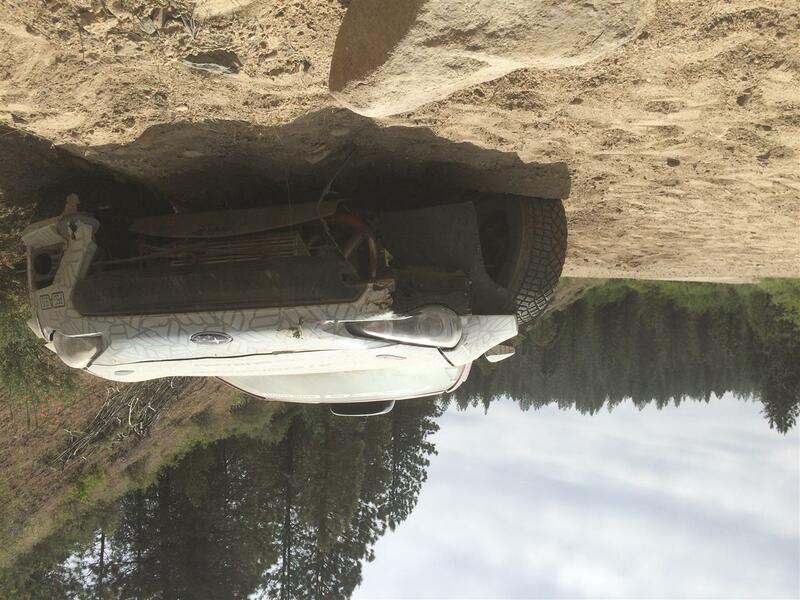 Idaho rally was a bit of a disaster for the BRZ part of the Nameless Rally team, I'm afraid. I lucked out and flew in late so I could skip recce, which was awesome. I've raced the Idaho roads four times before this and didn't really need to see them again, so I took advantage of an extra work day. Steven rode with the team owner and former service chief who had rented a rally car and entered the race so they could get some pro tips. Their rented rally car fared better than the team car, however. On stage 1, we lost oil pressure and smelled burning oil about 3/4ths of the way through the stage, so we coasted downhill to the finish and preserved the engine. After we got our time, we popped the hood and saw that the car still had oil, but definitely had a leak. Given the very short transits in Idaho, we headed back to service. The oil pressure sensor had broken and was leaking oil. The team found a plug and we soldiered on, sensorless. We made it through the next three stages decently, even setting a top 4 time on stage 3. However, stage 5 finally earned us our first non-mechanical DNF. We came around a blind right-hand corner and an 88 pound rock lay in wait. It took out most of the suspension on the co-driver's front and bent the fancy strut as we spun 180 degrees. We would not have been able to continue, but Idaho really drove that point home when we ended up in some very soft dirt along the side of the road and instantly dug in for good. Eventually, sweep extracted us from our hole and then brought us to our service crew. We repaired the damage on stage and drove the car on the trailer for the next day. Day 2 started decently, with a top 4 time in very dusty and glaring conditions. On the second stage of the day, however, the repaired suspension gave up and broke part way through. We managed to, eventually, cobble it back together and make it another half-mile to mile or so until it let go again. We were within a pretty short distance to the finish, so Steven ran up the stage to find the proper tools. We ended up borrowing a wrench from some folks camped by the stage and repaired the car enough to continue at a slow speed. Our stage time was almost 90 minutes slower than the slowest time! We talked to sweep and told them we'd transit the next stage to get back to service. After this ordeal it was understandable that the team did not wish to continue until the car was properly fixed, so we did not continue on the rest of the stages. A disappointing result, but in the end not too damaging to the car and still educational for testing purposes.